The University of New Brunswick’s Jessica Webster has been awarded the Allan P. Stuart Award for Excellence in Teaching for transforming the classroom experience. Each year, the Allan P. Stuart Award honours the hard work and dedication of instructors at UNB for their outstanding performance in the classroom, based on nominations from UNB students and faculty members. Ms. Webster is a senior nursing instructor on UNB’s Fredericton campus and got her inspiration to teach from her passion for nursing. In 2008, Ms. Webster joined UNB as a nurse clinician, primarily teaching in the clinical setting. She took on the role of leading classroom courses in 2015, in addition to continuing clinical instruction. Ms. Webster has received nominations for the Allan P. Stuart Award for the past three years. “I recognize how busy students are, particularly toward the end of term, so for multiple students to take the time, thought and energy to complete the nomination process feels like a tremendous gift to me,” says Ms. Webster. Ms. Webster also won the faculty of nursing’s first-ever Teaching Excellence Award this year, based on nominations from students and faculty. Nominators described her as welcoming, approachable and enthusiastic, as well as caring deeply about students and their education. For the past 19 years, Ms. Webster has been a perinatal nurse and has worked in reproductive and sexual health throughout out that time. “I absolutely love perinatal nursing and supporting young families’ health. 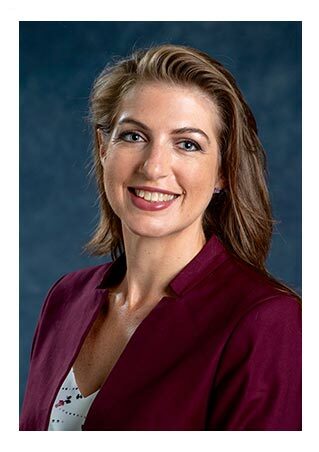 Over the years I have consistently sought out opportunities to expand my knowledge and understanding as the best available evidence changes over time,” says Ms. Webster. Ms. Webster’s teaching style stems directly from her nursing style. She strives to model both professionalism and approachability with students in all of her interactions. She endeavors to create a safe learning environment for the students she works with and tries to cultivate genuine connections with each student and colleague she encounters. Ms. Webster utilizes several teaching strategies to engage students in learning, including instant-feedback technology, multimedia platforms and learning management systems. She provides vivid examples from her clinical practice, using case scenarios for students to understand the information through application in a nursing context. Through discussions and reflective activities, Ms. Webster helps her students establish deeper understanding of course topics and what they will mean for their developing nursing practice. In addition to Ms. Webster’s work in the classroom, for the past four years, she and UNB’s Global Learning and Engagement coordinator Veronica McGinn have supported students to complete a 90-day international internship in Malawi. Funded through the Queen Elizabeth Diamond Jubilee Scholarship fund, Ms. Webster and Ms. McGinn have developed partnerships in Malawi to increase opportunities for UNB nursing students to partner with Malawian nursing students, nurses and midwives assisting in a variety of capacities supporting maternal-child and family health. “The opportunity to live, work and learn in the beautiful developing country known as ‘the warm heart of Africa’ provides an exceptional and truly transformative learning opportunity for our students, which I feel very fortunate to facilitate,” says Ms. Webster. Above all, she works to get to know the people in her class and encourages them to share their knowledge with her. Ms. Webster will be presented with the Allan P. Stuart Award at the 2018 Fall Convocation. 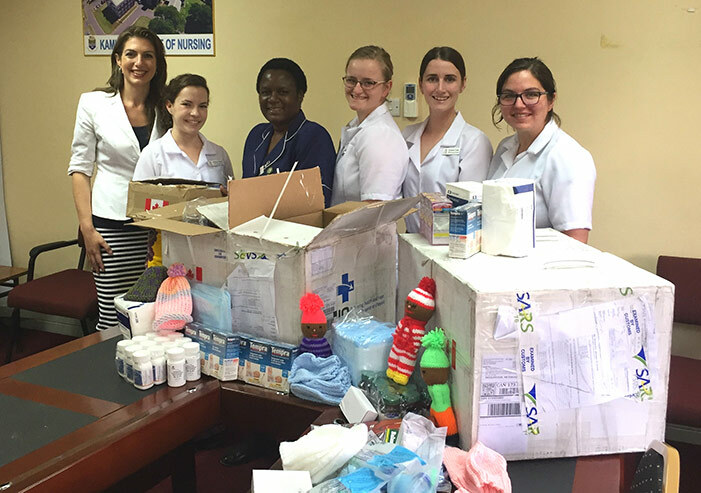 Photo: Ms. Jessica Webster, left, with UNB Nursing Queen Elizabeth Diamond Jubilee Scholars delivering medical supplies to a faculty member at the Kamuza College of Nursing in Malawi. The UNB students from left to right: Mallory Smith, Kaley Fitzpatrick, Amelia Foley and Kayla Beck. Credit: Veronica McGinn/UNB.